The environmental exemption for native forest logging is governed by Regional Forest Agreements (RFAs). These 20-year contracts, like the Coalition’s stalled ‘one stop shop’ plan, hand state governments the power to make environmental decisions about native forest logging. Numerous assessments show how comprehensively they have failed. RFAs start expiring from 3 February 2017 (East Gippsland) followed by Tasmania, other Victorian RFAs, WA and NSW. Special treatment for native forest logging should end. RFAs should be abolished forthwith or at the latest when they expire. 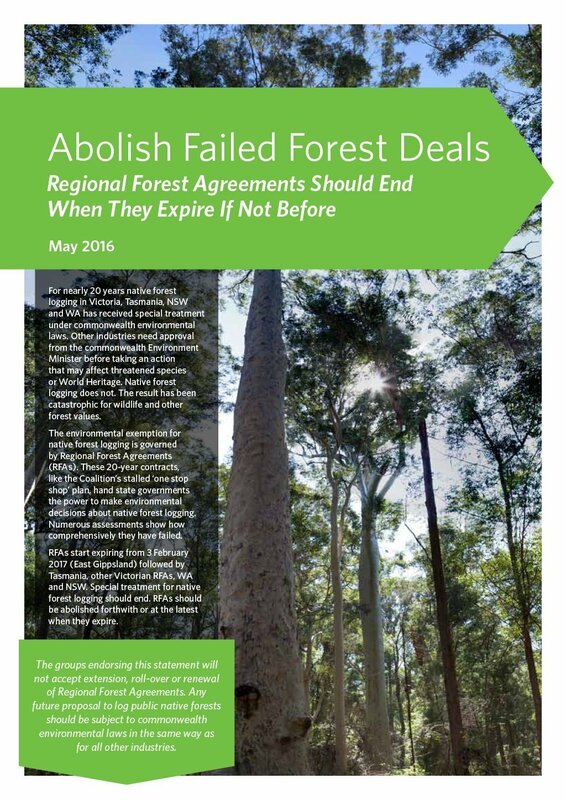 The groups endorsing this statement will not accept extension, roll-over or renewal of Regional Forest Agreements. Any future proposal to log public native forests should be subject to commonwealth environmental laws in the same way as for all other industries. Ten Regional Forest Agreements (RFAs) were signed between 1997 and 2001 covering about 6.8 million hectares of native forests in Victoria, Tasmania, NSW and WA. These forests are home to an array of species found nowhere else and are vital for water, climate protection and recreation. Numerous assessments show that RFAs have manifestly failed to protect wildlife and threatened species or other values. The domestic wood products industry meanwhile has shifted almost entirely to plantations as have export woodchip markets. The residual native forest logging industry continues to be rife with conflict as recent arrests in Tasmania and WA and serial court cases in East Gippsland attest. Importantly the preferential treatment given to state government forestry agencies under the RFA regime has blocked opportunities for growth and innovation in competing forest industries like carbon, tourism and water. By effectively handing logging rights to the forestry industry, the RFA and surrounding policies have created a major obstacle to realising the value of forests for carbon storage and climate protection.Water availability and quality is degraded. Tourism is unable to compete as so called ‘amenity values’ are not meaningfully considered in state logging planning even in places that are recognised tourist attractions.Regional development proposals such as for new ecologically appropriate tourism are put through impossible planning hurdles, stalled until investors lose interest, and in some cases need approval by the logging agency itself — which inevitably gets blocked as it is a competitor for use of the resource. While the RFAs have given the logging industry unparalleled access to native forests, opportunities to create new jobs and businesses in regional areas have languished as the publicly owned native forest asset is liquidated for logs. RFAs are an economic as well as an environmental disaster. They cannot credibly be extended on the basis of environmental assessments dating back to the 1990s nor can they accredit state government processes that have demonstrably failed. Native forest logging on public land should end. If any native forest logging is proposed in the future it should be subject to commonwealth environmental laws in the same way as every other industry, not exempted through the RFA regime. No Replies to "FLBP signs on to joint statement on Regional Forest Agreements"